Interior trim can add spice to every room from the ceiling down to the floor. 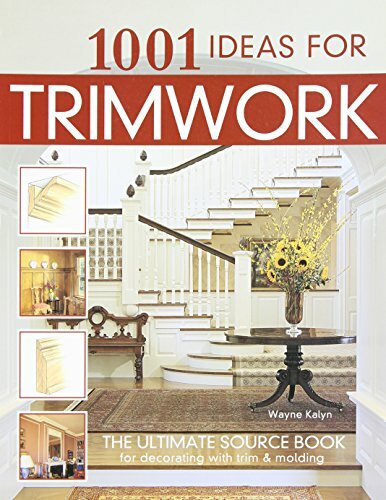 Trim is functional when it covers the gaps where different building materials meet. This happens where the ceiling meets the walls or the walls meet the floor which is why we have baseboard trim. There are many interior trim ideas you can use as a decorating tool to dress up some of the simple features in a room like windows and doorways. For the interior designer or Do-It-Yourself homeowner, finding the perfect “spice” for a room you already love isn't always easy. Having chosen furniture, window treatments, throw rugs, and furniture layout, the room may still lack the sizzle you want to create that perfect look. Interior trim is the perfect way to accent your room to put more focus on it's best features. Sometimes you simply need a small tweak to tie all you've done together, to achieve the desired results. Basic trim in every home includes the baseboard plus trim around doors and windows. All of this trim covers up the gaps where the drywall (also called sheetrock) meets the floors, windows and doors. After these basics, the most common types of interior trim are crown molding and chair rails but there are many interior trim ideas to consider when updating a room in your home. This series of article provides a glimpse into the many choices you have to enhance your home's interior beauty. When I've got a real project, I prefer any of the books from Taunton Press or Creative Ideas. I probably own half of them already, and will buy more as I remodel my home. 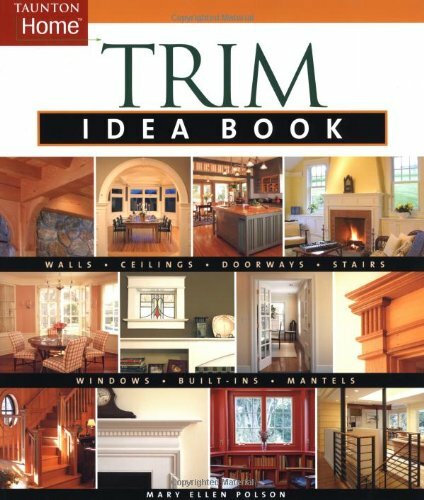 Once you find your favorite interior trim ideas online, these books provide context for understanding what you're considering for your home. That's because you can get into trouble when you only look at one decorating feature in isolation. Once you find the look you want, your next decision is how involved you want to get in the installation. 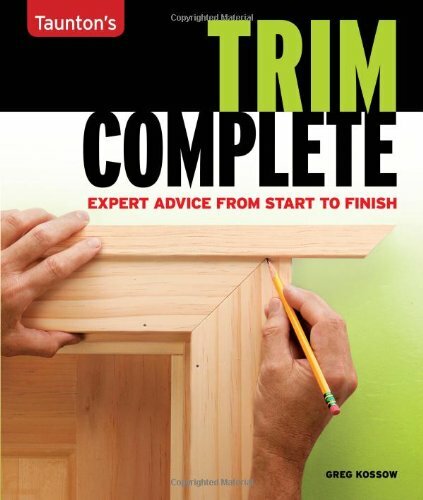 Decide if you want to install the trim yourself. Are you proficient working with wood and a compound mitre saw? There are new trim products with pre-finished inside and outside corners. When I peeked at what's available on Amazon, I was amazed to find this “peel and stick” crown molding. More amazing is a photo showing you can cut the molding with scissors. As I haven't tried using this new trim, I'm honestly not sure what to say other than try it out. That's what I'll be doing soon. For more challenging trim installations, some contractors are flexible and willing to partner with you on a project. You need to follow their advice as they're going to be concerned about the finished product which includes your work. In my handyman business, we often got calls asking us to finish projects that a homeowner started. When they realize it's not as easy as it looks and they don't have enough time (tools or skills) to finish it, it does make sense to call for help. We always felt good getting the job done, with one exception (click to learn about one of my most feared handyman requests). For most do-it-yourself homeowners, you should stick to trim that will be painted. Once you've installed the trim, you can fill in the gaps with caulking to get smooth surfaces. If you're going to stain the woodwork, you're better off hiring a master carpenter as it's almost impossible to hide gaps and other mistakes with stain. Unless you're an amateur home carpenter with lots of experience using a compound miter saw, stick with designs that use more straight cuts. Crown molding is challenging so if you're determined to install it yourself, find a company that offers pre-cut corners. When ordering these from somone like sosimplecrown.com, pay close attention to their recommendations for measuring and order extra because you will make mistakes. PS Loved the simple yet elegant wall trim shared here. It's striking, fairly easy to install with straight cuts and functional as the wood is harder than drywall, protecting the wall from damage when the homeowner slides their desk chair back too far. Over the last few years I've seen a lot more creative interior trim ideas in model homes, so here are just a few of them. I think it’s awesome to add this to your home. It makes the room look more beautiful. I like the ideas that you showed above. Se manifique! such awesome and creative interior decorating ideas. I love the way the trim looks. I think it makes a home look elegant. 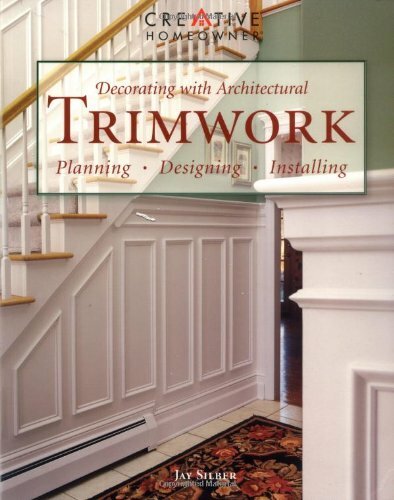 I’ve always loved the look of trim. I’m going to see if I can use the “peel and stick” crown molding without worrying about it messing up my walls in my rented apartment. We’ve just put moulding where the ceiling meets the walls and it’s made such a difference. Everything looks so much neater and tidier so I’d really recommend it! Thank you for this. I am terrible with design, so this is really helpful. I have friends who are architects and interior designers and I forwarded them the link to your post. They love your ideas! I do too and I could draw inspiration from it when we decide to re-decorate the house. Thanks Annemarie, Please let me know if there are any other interior trim ideas you’d like me to write about. After refreshing this post, I realized there are many more ways that people are adding trim to their homes & I’ll be sharing more of these photos which are now being edited. Some great ideas here, i haven’t thought of doing this before! Gorgeous rooms too! Love that stick on trim. It makes decorating so easy. I agree that it looks really cool & would change how we decorate our homes. I’m just hopeful that up high on/near your ceiling and painted, it will look like wood. These are fabulous ideas! I love trim in homes. It really does give a unique pop to any room. You have a great website here, thanks for sharing. Just read this article & really enjoyed it. I have been looking for blogs like this & they are hard to find. Your blog is the best, I love it.